It's that time of year again. We all do our best to comply with the vast array of tax laws out there, while trying to get the deductions and rebates we're owed. But what if you make an honest mistake, or try to cheat the IRS, and get a dreaded audit? Is it really as bad as people say? Well… sometimes, it can be even worse, as these 10 reasons show. Do not think, for one second, that the money in your bank account is safe and sound. The IRS has incredible power, and if they choose to do so, they can simply place a levy on your account and take your money. This happened to Joan Smith, a 52-year-old artist from Philadelphia. In 2010, she was preparing to go into the hospital for spinal surgery, when the IRS put a $10,000 tax lien on her account. This was, in fact, more money than she even had in the bank. And all because she did not receive an audit memo that was sent to the wrong address. It took her 11 months to dig herself out from that tax hole. You may have been told that the IRS statute of limitations was three years from the date you filed your taxes. Not anymore. The IRS now has a series of exemptions that increase the amount of time they have to audit you. For example, if you omitted more than 25% of your income, the IRS can now hit you up six years after you filed. And, if you forgot to file certain forms, the IRS can audit you at any time in the future. Basically, 30 years from now, you could get a letter in the mail from the IRS. And if you no longer have records, you could be in trouble. Which brings us to our next point. So you get the dreaded audit notice. And in this case, it's not one that is handled by mail. You actually have to meet face-to-face with an auditor. 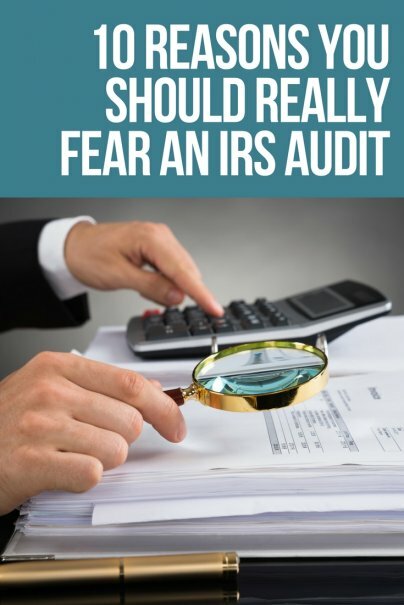 Even if you are fully prepared, and have all your ducks in a row, you could say or do something that leads the IRS to audit more of your tax returns than the one in question. For instance, saying something like, "Well, I have taken that deduction before and it was fine," could lead the investigator to look into several returns, not just the one that has been flagged. In the case of an audit, you may want to look into getting some legal help. Don't think that an audit is simply a few weeks of gathering up paperwork and checking a few boxes. Audits can sometimes take years. Take the case of Tim and Tracey Kerin. Their accountant hadn't correctly evaluated their expense categories, which led to an audit. But, it didn't go smoothly. In fact, they ending up spending over 30 months battling the IRS to prove their innocence, spending over $95,000 in legal fees. Unlike the justice system, the IRS operates on the principle that if you have done something wrong on your tax return, you are guilty. You owe them money. You have to provide the paperwork to prove you are innocent, or you will face the full wrath of the system. If you cannot comply, you can literally wake up to find out your bank account has been frozen, and there's not much you can do about it. So, you made a genuine mistake. You owe the IRS money. Well, you don't just owe them the unpaid taxes. You also have penalties to pay, and interest, too. As the IRS states on its website, the "penalty starts accruing the day after the tax filing due date, and will not exceed 25% of your unpaid taxes." That means if you owe $4,000, you may end up owing $5,000. Rather than incur the penalties from the IRS, find another way to pay, and get them their money quickly. You could arrange a home equity loan at a very low rate. Just get them their money, or the debt can really start to add up. If you owe money, and don't have any way to pay back the sum of money owed, the IRS has the power to garnish your wages. Your employer has to comply fully with the IRS, and you will suddenly find your monthly paycheck has become smaller. Not only that, the IRS can also levy your retirement accounts, rental income, life insurance policies, or anything else of value. And this is all stated right there on the IRS website. This is a warning. If you have any doubts, ask Willie Nelson, Nicolas Cage, or Ja Rule. One way or another, the IRS will get their money. If the audit reveals that you owe money, and you have no way to pay, then the IRS will start looking into your assets. If you own your vehicle, they can seize it, sell it, and apply the funds to your tax debt. Worse still, if the debt is large enough, they could actually take your home, sell it (they won't hold out for the best price), and apply that to your debt. If you do owe a large sum of money, you need to get professional advice. You do not want to be left homeless and penniless because of an IRS audit. If worse comes to worst, you may actually find yourself behind bars. This is unlikely unless you are found guilty of major tax fraud and evasion, owing more than $100,000. But if it does happen, you have committed a federal crime and that can come with a hefty prison sentence; in some cases, up to five years. What's more, the fine could be as much as $250,000. Your whole life could be ruined, all because of a genuine mistake, an oversight, or because you put your trust in a bad accountant. When it comes to taxes, you do not want to mess around. Do you have any IRS horror stories? Or any advice on how to deal with an audit? Please share your experiences in the comments. That's odd. I didn't see any IRS official get that harsh of punishment when congress was auditing them. The IRS conveniently lost all records just before the audit.